How do you want to spend your family time on snow days? Why not tuck your kid and yourself into a tube, grab onto the handles and enjoy exciting riding moments? With our large snow tube, your family definitely will have unforgettable ski riding experience this winter. 100% physical photography. However, many factors might affect the color of the picture. Please in kind prevail. ◆ This is not a towable device. Never tow from behind any vehicle. Do not stand or kneel on the sled during use. due to increased lack of control. This product may have limited. ◆ Braking or steering, or none at all. Beware this product can develop high speeds under snow conditions. ◆ Excess speed can cause loss of control and serious injury. Do not use near street, roadways, driveways or sidewalks. ◆ Do not use in the proximity of trees and other fixed objects. Avoid obstacles and rough terrain. ◆ Competent adult supervision suggested. The wearing of helmets and safety goggles is strongly recommended. 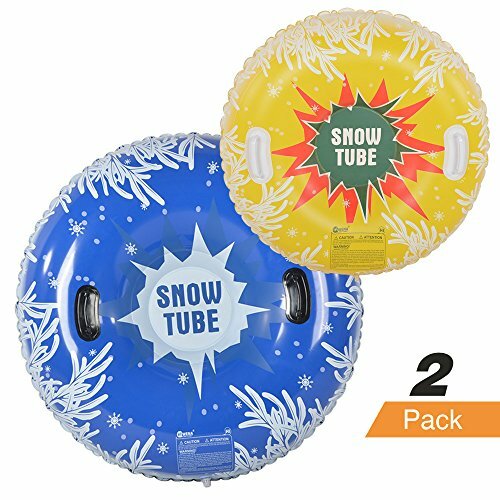 Huge Snow Inner Tube: 2 Pack Snow Tube Design for kids and adults, bringing you and your families much more fun of winter recreation. At 44 inches wide, this snow tube of heavy duty withstands up to 300 lbs. It is large enough for an adult. And 33 inches wide snow tube suit for kids. Thicken PVC Materials: Made of 0.5mm thicken PVC materials, its bottom is solid and perfect for fast sledding on snow. K80 materials guarantee our ski tube to work well at a low temperature. Sturdy and Bigger Handles: Two sturdy handles are added onto the snow sled for safety. You can easily get your hands through the handles with gloves on. Safety edging process ensures comfort for grabbing. Carrying the tube becomes easy with candles. Repair Patch: A first-aid repair patch is included.In case of a hole or a leak caused by accidental puncture or tear. If you have any questions about this product by Hiwena, contact us by completing and submitting the form below. If you are looking for a specif part number, please include it with your message.